Polycyclic aromatic hydrocarbons (PAHs) are ubiquitous contaminants of the human environment, and some PAHs are relatively potent carcinogens. This chapter reviews the chemistry of the PAHs and their heterocyclic analogs and surveys their most important types of reactions from the viewpoint of their potential environmental significance. PAHs in the environment are subject to various chemical and photochemical processes some of which result in degradation to less toxic products, while others result in formation of compounds, such as nitrosubstituted PAHs, which exhibit greater carcinogenicity. While the major focus is on the reactions of the more intensively investigated alternant hydrocarbons, the nonalternant PAHs and the heterocyclic aza- and thio-PAHs are also discussed. 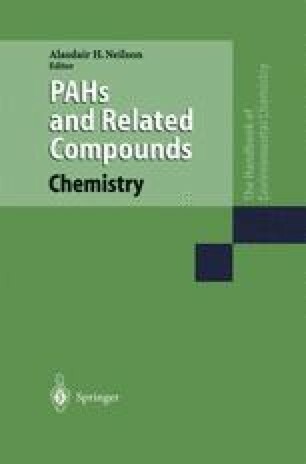 Current concepts concerning the mechanisms of carcinogenesis of the PAHs and their heterocyclic analogs are also reviewed. Nomenclature aromaticity Clar structures planarity substitution oxidation automerization photoreaction reduction complexation metabolism carcinogenicity.